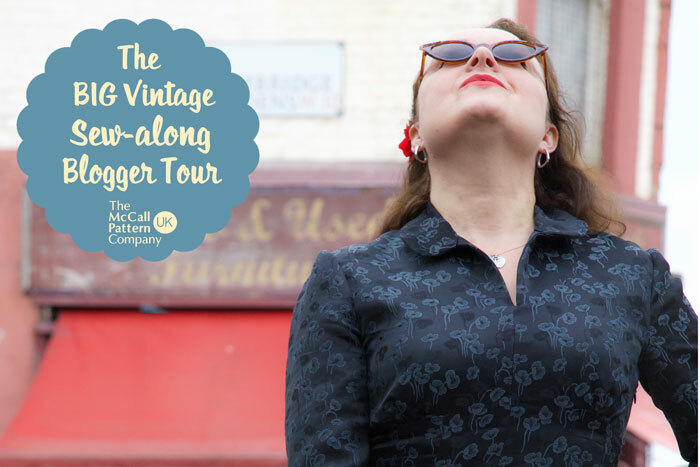 Back in March I announced I was taking part in the McCalls Big Vintage Sewalong. My scheduled date to blog seemed an awful long way off then, but all of a sudden today came shooting along like an express train and of course I’d left everything till the last minute! 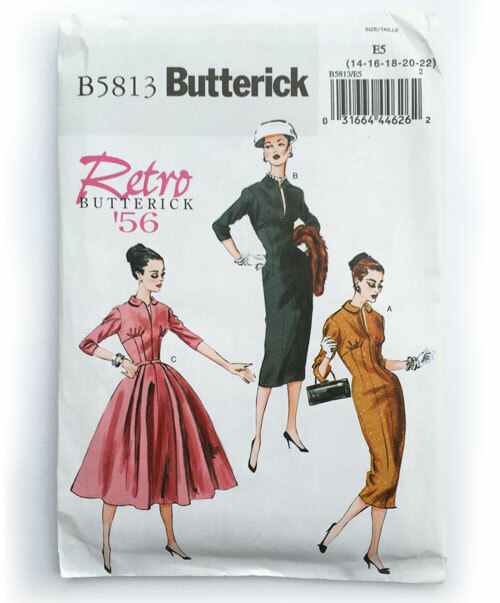 My pattern of choice was the 1950s Retro Butterick 5813 – Nail on the head, Alana from Flying Purple Hippos.com! – but it wasn’t without a dither. I loved each of the three 1940s patterns on offer too! 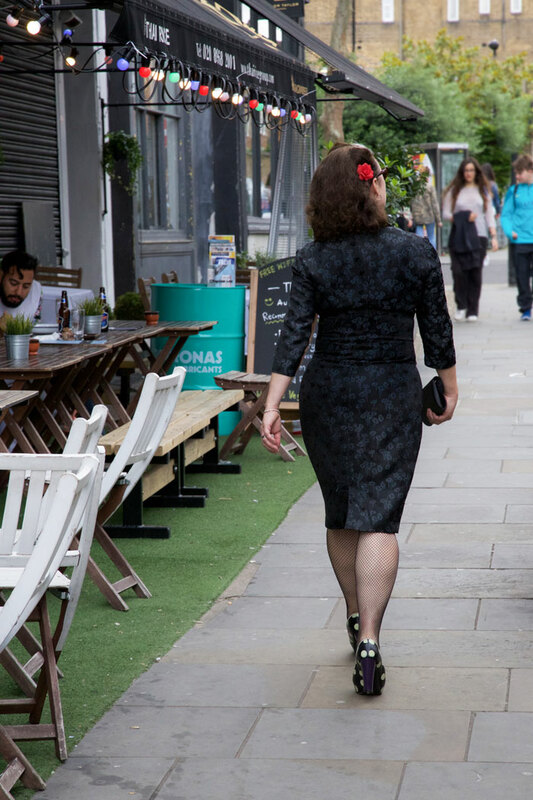 As soon as that pattern was in hand and I’d decided on version A, I headed straight down to Goldhawk Road and to the relatively new store, Goldbrick Fabrics, to snap up some gorgeous Italian brocade. I’ve been quite literally ‘stitched up’ (or rather unstitched) by brocade, once before (yes looking at you BHL Georgia!) and I knew as a rule, it has massive ‘give’ issues but this particular brocade is beautifully soft and luxurious with just the right amount of body at the same time and subsequently a little more forgiving. And because the fabric was so special I wasn’t about to employ any gung ho scissor action. So I made a toile like the good girl I am. Fortunately I only had to make a few minor adjustments. Firstly I needed to remove some excess bagginess from the back bodice. I often come up against this issue but this style commanded some serious ease for practical reasons of movement I guess. Secondly, I needed to gain a little more girth. My go to adjustment for this is always to add a bit at the side seams but that often results in a loss of shape and a sausagey silhouette, so I thought I’d try a different way by sewing narrower darts and I do believe the result was way better, though, looking at the back view shot I should also have shortened the bodice a tad. Thirdly, I lobbed a fair bit off the length. I ummed and arred between below the knee or to the knee but I think after seeing these photos, an inch longer may have added a bit more drama. What do you think? I sewed a substantial hem so I could take it down a little I guess. I wouldn’t recommend this dress to an absolute beginner. 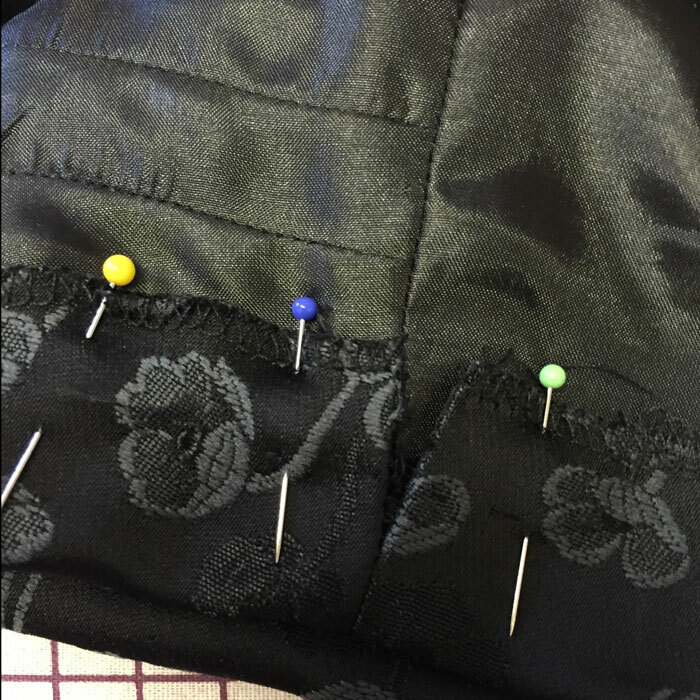 There are potentially, lots of hissy-fit inducing features like darts – lots of them, some underbust gathering (which admittedly would probably have been easier in a more manageable fabric) oh and inset panels! Luckily I’ve had some former training with insetting sections of my quilt panels – for example the Whirligig block –which made the instructions and the construction a near enough breeze! 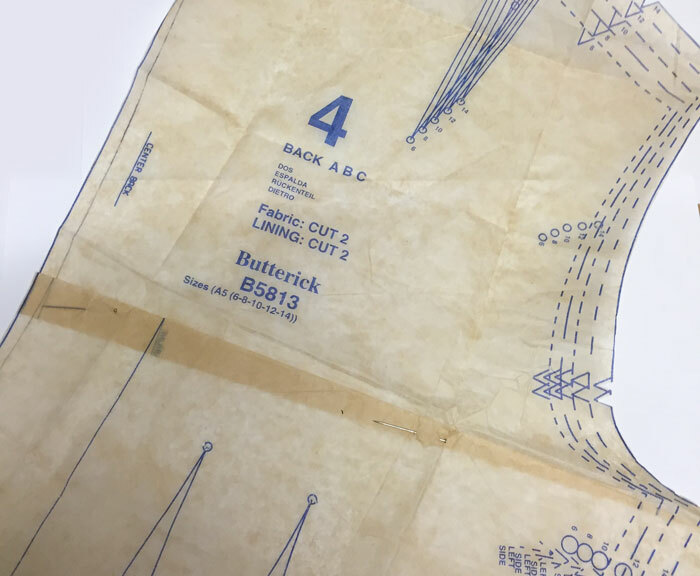 Another thing to be mindful of is the precision of facing the front opening – sewing perfectly symmetrical seams to meet at a single point before turning through. I think the collar is such a lovely feature of this dress. There were no complications in adding it and it has a real neat finish that encloses the lining around the neck edge. It’s fully lined too which means sleeves an’ all! 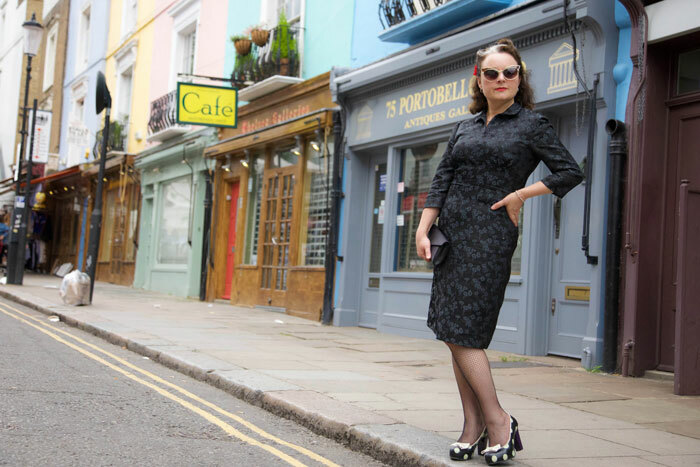 I’ve only ever done this twice to my ever failing knowledge: My vintage plaid dress (which annoyingly seems to have disappeared from my blog) and more recently my Sew Over It Joan Dress. And I must say it feels like a bit of a rip off to have to basically construct the dress all over again in lining, no cutting of corners, darts, gatherings, inset panels the lot! And that means even more seams to overlock too! But of course it was all worth the effort and it’s so lovely and weighty. Proper quality, like! I’m not sure whether I cut or sewed the wrist end of the sleeve incorrectly but in any case I opened the seam a little to avoid the puckering that was about to happen. And yes those are 3 little darts for shaping the sleeve. 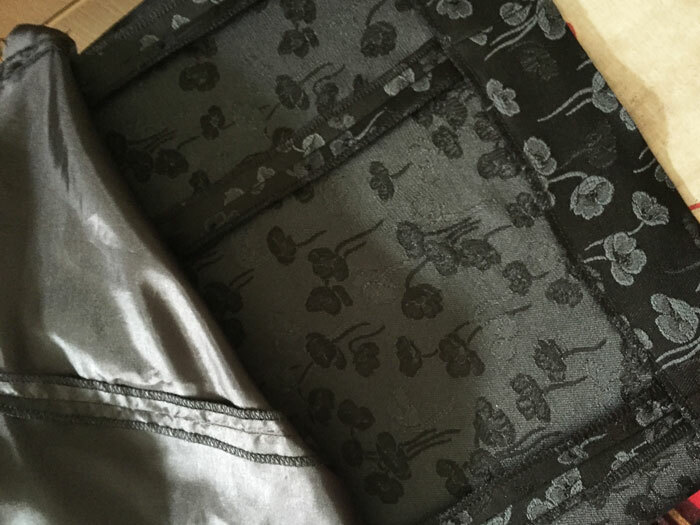 On the fashion fabric and the lining. That’s proper vintage detail! I chose an invisible zip over a more-authentic lapped one, only because I had one to hand but I’m really pleased with the outcome. It just looks like another side seam. I achieved such invisibility by taking my time for once, pinning and then tacking in position before using a regular zipper foot and then sewing a second time with the invisible zipper foot. One thing that surprised me was the vent. It’s just a slit with facings either side and the lining is stitched to the facings like a little bridge around the outside. 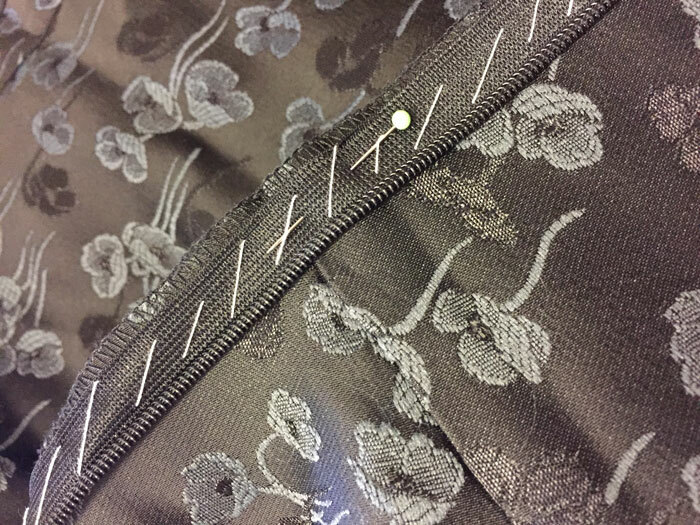 Much simpler than the usual lined vents or kick pleats of most vintage dresses I’ve sewn but it does feel like a bit of a cop out after all the attention to detail elsewhere. Overall I totally love this dress. It was such a pleasure to indulge in some vintage sewing again. Very long overdue and I’d love an excuse (and some more hours in the day) to make another. But I’d make a few more adjustments next time, namely taking a bit off the shoulders, shortening the bodice a fraction and adding a little more to the waist. 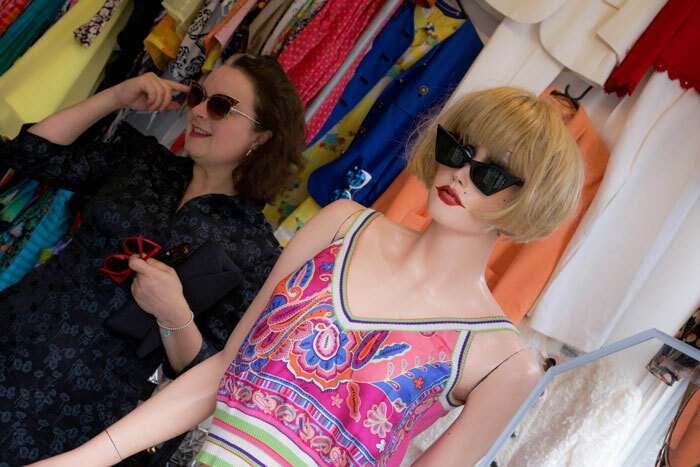 It got some lovely comments as we strutted around Portobello Road and around Notting Hill. Not least of all from the lady who managed to sell me 2 new pairs of sunglasses. Flattery gets you everywhere, see! Many thanks to The Foldline for the encouragement, for McCalls Pattern Company UK for providing the pattern and fabric. I sincerely hope that lots of people get inspired to buy these gorgeous vintage patterns and that lots of wonga is raised for The Eve Appeal in the meantime. Special thanks also to Dan for dutifully shooting these amazing photos. We always have such fun. London is so full of amazing places and we’re lucky that most of them are just a short tube ride away. It’s always a hoot when we’re oot and aboot! Marie from A Stitching Odyssey is next up. Can’t wait to see what she makes. Following on from my far-from-successful Burda top, I needed a bit of a sewing massage. A project that would give me a couple of hours of soothing sewing action with the gratification of a good result guaranteed. Plus I am in desperate need of some new tops and fast! – Tilly and the Buttons Agnes top to the rescue! Ordinarily I’m not sold on making plain T’s. Life is way too short. But this fancy T was just the ticket. I adore those drapey puffy sleeves and the bust-enhancing ruching to the centre front. 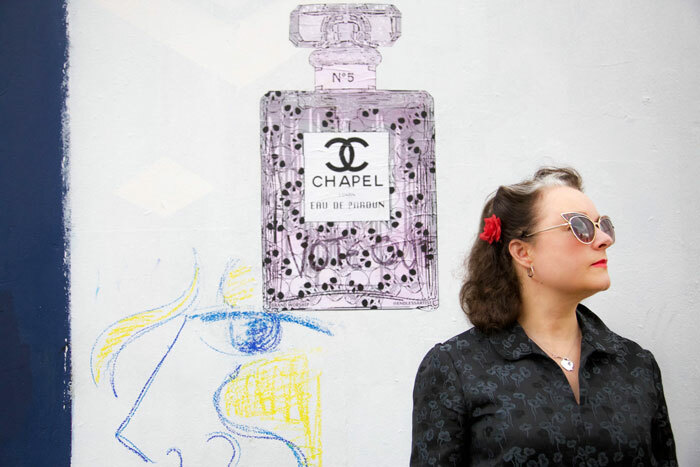 So ‘casually chic’ if that’s even a thing! I haven’t sewn this top before but I have sewn Tilly’s Mimi blouse and the Coco top, both of which sewed up and fitted without hitches so I’d have bet big bucks on this being the same. Couldn’t have been more right if I tried! I obeyed every instruction which if I’m really honest generally makes for a smoother exercise and in any case they are so clear and easy to follow it’s effortless really. I sewed the whole thing with a zigzag stitch on an ordinary sewing machine, as suggested. But I finished the seams on my overlocker. I only have a vintage, 3-thread kind which doesn’t stitch, just finishes, but it does the job beautifully. The only bit I foresaw repeating a couple of times, was the neckband. But to my surprise it went on like a dream. Tilly has completely allowed for the right amount of stretch so that it doesn’t go all baggy. 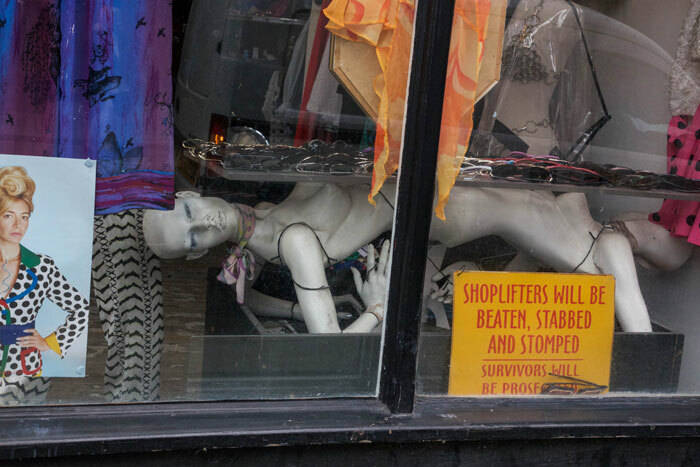 Though in fairness that could have been down to the quality of the fabric I used – a great quality cotton stretch from one of the shops down the Goldhawk Road. And it’s black and ivory too, (instead of navy and white) which I’m delighted with. But I am a bit agged by the unavoidable issue of the stitching that shows down the centre of the ruching though, owing to the stripes – sleeves and centre front. I will make a solid black one at some point which will alleviate the problem. But I am left wondering whether I should have stiched with white/ivory thread instead of black. Or would it have created the same problem in reverse? We had such fun shooting these photos. 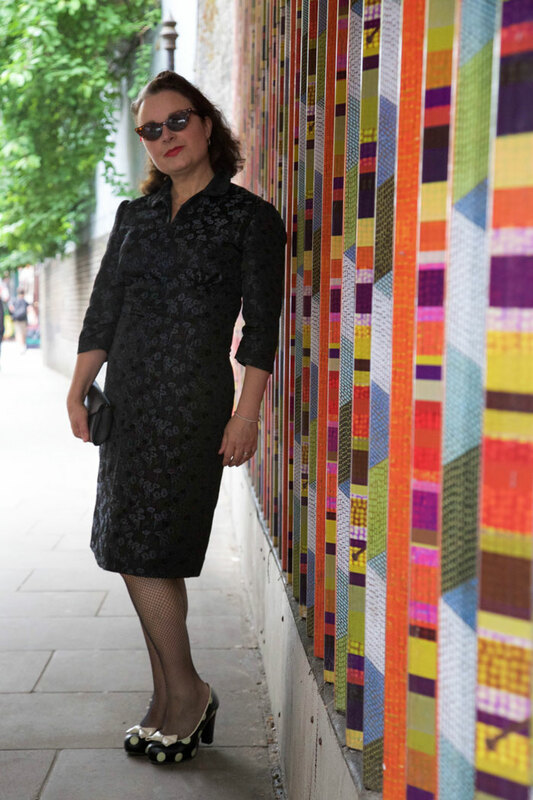 Mr O had found this area in Waterloo, London, and thought it would create a great backdrop to an otherwise monochrome outfit. He wasn’t wrong. He seldom is. But best not to let him know that! I don’t often get Mr O all to myself so after a stroll around all the little vintage shops of Lower Marsh Street, we stopped off for a delicious lunch at Bar Cubana. I could get quite used to these kind of Wednesdays!